How should I take my pension benefits? Since the chancellor, George Osborne, gave his Budget speech, the media has been full of scare stories about people blowing their pensions on fast cars and holidays. But what’s the reality for most people? Jason Butler gives an overview of the options. The earliest age at which you can take benefits from your pension is usually 55, unless you were in a special occupation, and had pension arrangements in relation to that occupation, which permitted earlier access (e.g. sportsperson, model, diver etc) before 6 April 2006, or you qualify for a severe and permanent ill-health pension. There is no longer an upper age limit by which pension benefits must be taken, whether that is as an income or lump sum. Despite the perception of poor value, a guaranteed pension annuity (whether level or inflation protected) is insurance against living too long. 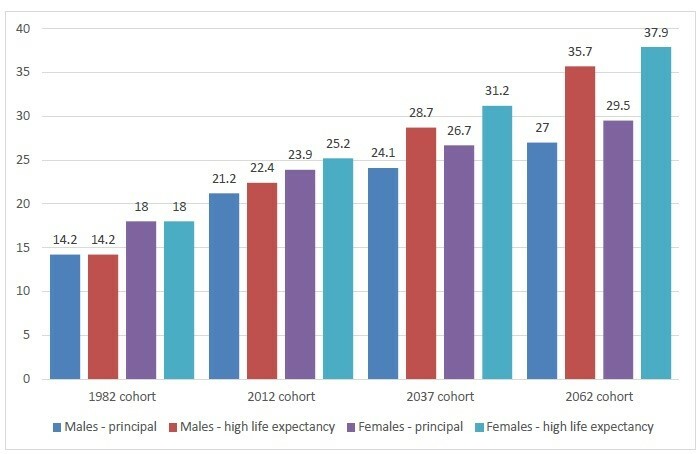 Life expectancy has been rising in the UK over the past 50 years. Unless you have a terminal health condition, or a family history of short life expectancy, it is impossible to know how long you are likely to live. All the evidence suggests that it will be a lot longer than you think. As a general rule it doesn’t make sense to take on the risk of living too long (longevity risk), particularly if you expect above-average life expectancy. Therefore, for most people a guaranteed annuity is likely to be a good choice for some or all of their pension assets. It’s also low cost, simple and requires no ongoing management. Pension benefits are usually available in the form of a taxable income and a tax-free lump sum, known as a pension commencement lump sum (in most cases this is 25 per cent of the fund value). In the case of a defined benefits pension scheme, the lump sum can be in addition to the guaranteed pension income (most commonly in government-backed schemes or those operated by companies that were previously government-owned) or in return for giving up some of it, known as commutation. You can take pension benefits gradually over a number of years and use tax-free lump sums to provide cash inflows to meet your lifestyle expenditure each year, together with taxable income either directly from the fund or from the purchase of an annuity. You could take the maximum pension commencement lump sum from your whole pension and then have the choice of taking a taxable income or, from April 2015, you may also take the entire fund of a defined contribution pension scheme (after deducting the tax-free lump sum amount) as a taxable lump sum. Prior to that date, taking a taxable lump sum requires the member to have a secure (as in state pensions, guaranteed annuities and benefits from a defined benefits scheme) pension income of at least £12,000 per annum. ◾ Whether and to what extent the withdrawn capital would give rise to a higher inheritance tax liability for your estate and whether this is a concern for you. State and private pension income, lump sum taxable pension fund withdrawals and income from employment and self-employment form the first slice of taxable income. To the extent that such income (or taxable capital pension withdrawals) uses up some or all of your lower and/or higher rate income tax bands, it can affect whether or not you retain your personal income tax allowance and the rate of tax that you pay on rental income, interest and dividends, which form the top slice of taxable income. The tax rate applied to taxable pension lump sums is determined in the tax year in which you take the benefit. 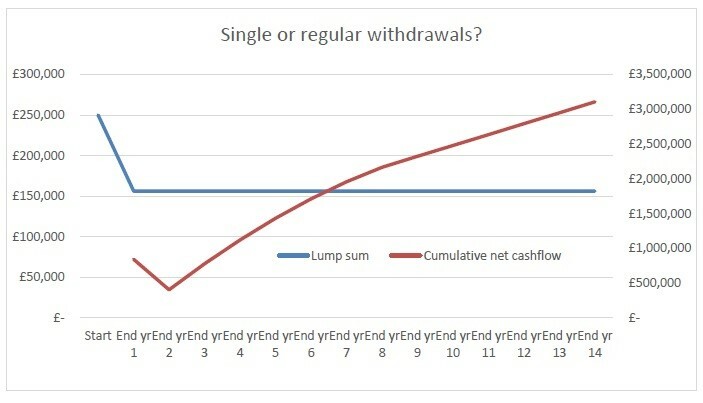 The chart below shows the cashflow position of a £250,000 taxable lump sum taken from a pension fund, compared to taking an annual withdrawal of £20,000 within the basic rate income tax band. Disregarding investment returns and inflation, taking the regular withdrawals provides the higher amount of net cash after just six years. Clearly different assumptions will produce different breakeven points, but the key point is that for many people, particularly with larger funds and other sources of taxable income, taking the pension as a single taxable lump sum is likely to result in a lower cash outcome. Source: The Financial Times Guide to Wealth Management (2nd edition), Butler, J, Prentice Hall. ◾ It may be that a mixture of guaranteed standard/impaired life annuities, income drawdown and lump sum withdrawal will help you to have a successful retirement. If you have low confidence about how to take your pension benefits and the financial impact of a bad decision would be high, then seeking the advice of a qualified and regulated UK financial adviser might cost you some money in fees, but is likely to be the best investment you ever make. Need help with your pension? Download our pre-retirement checklist and speak with an adviser to talk about your options.